Welcome to the NEW micecomics.com - finally here after nobody demanded it! Mice is an independent comic book series written and drawn by Mary Minch published every few hundred years or so. Mary's artwork, and read some classic Mice comics online! 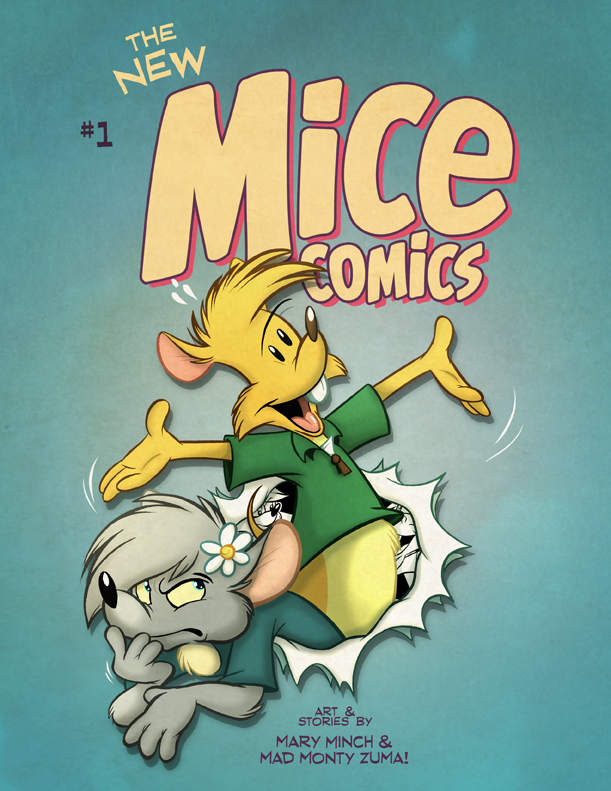 The New Mice Comics #1 - ON SALE NOW! I'm so excited to let you guys know that the New Mice Comics #1 is finally available online to purchase! Taking Mary and Stephen back to their zany cartoon roots, the New Mice Comics is a 28-page 8.5" x 11" JUMBO comic book. This time around, the stories are written both by myself and my husband, who likes going by "Mad Monty Zuma" cause he's special. Stories included are Sell Out, Extra, No, The Prize Inside, and more! Pick up YOUR copy today at Mary Mouse's Stash! Also Available NOW - Crappy Critter Trading Cards! Created as a tribute to old-school Garbage Pail Kids, Crappy Critter Cards are here! Each pack contains five cards and a checklist! Series 1, 2 & 3 are available now. The backs of the cards also fit together to make a puzzle. ​Pick up your very own pack of Crappy Critter Cards today at Mary Mouse's Stash! ...more to be announced as plans are confirmed! For comics, art, Certified Tags and more, chek out Mary Mouse's Stash!